Trainer Gordon Elliott and amateur Jamie Codd completed a 39/1 double when Fayonagh flew home to land the Weatherbys Champion Bumper. Codd, who works for auctioneers Tattersalls Ireland, bought Fayonagh for £64,000 at the company's Cheltenham December Sale on behalf of Edward and Maura Gittins - they had no big ambition about running in the Weatherbys Champion Bumper, and were planning sending her to a race at Sandown last Saturday until Codd intervened and suggested today's race was winnable. The plan nearly unravelled at the start, when Fayonagh was left flat-footed, knocked sideways and then set off behind the field. Elliott said: "I wanted to run onto the track and tell Jamie to pull up." Yet she flew up the hill at the finish to win by one and a quarter lengths and one and a half lengths from Debuchet and Claimantakinforgan. Elliott said: "Jamie gave her a great ride - she must be tough. The start was something else. Jamie bought her and recommended she be sent to me. I was worried about the ground, and she just stood at the start [a standing start took place following a false start]. That was a pity because she jumps brilliant. "She's schooled over hurdles, but if she never does anything else it won't matter because she's won a Listed bumper and now a Grade One bumper. She could be a filly to run on the Flat, too, possibly at Royal Ascot." Mark Gittins, the son of Maura and Edward, and son-in-law of retired top jockey Mick Kinane, said: "My parents [who are breeders of racehorses] love National Hunt racing, while I would be pushing more towards the Flat. Jamie was at the sales, picked this mare out, and rang to say 'I've seen a lovely Kalanisi mare that would suit you'. "My father is from Liverpool, and so they wanted a mare to run in the [Listed] mares' bumper at Aintree. The plan was to go to Sandown and then Aintree, until Jamie said we should come here. She showed an unbelievable turn of foot out there, yet going past the stands I thought she had no chance." Jamie Codd rode his second winner of The Festival 2017, taking the Weatherbys Champion Bumper on Fayonagh, having won the Glenfarclas Cross Country Chase on Cause Of Causes 80 minutes earlier. Like Cause Of Causes, Fayonagh is trained by Gordon Elliott, for whom it was a fifth win of the week. Codd helped owner Maura Gittins to buy the six-year-old Kalanisi mare last December at the Tattersalls Ireland Cheltenham Sale for £64,000. She was a comfortable winner of a Listed bumper at Fairyhouse last month, and was sent off at 7/1 today. But she looked to have lost all chance at the start of the race, jumping off late and spending most of the race at the back of the field, charging through from last to first up the hill to beat Debuchet by a length and a quarter. Codd said: "We had a false start. I had a great position for that, and I was actually lined up nicely for the second start but she got a fright and just halted for about two and a half seconds. I thought I had lost all chance, to be honest, and so I just followed them. "All the way down the hill I followed, followed, followed, and just once I switched her out turning in, I thought I'd run on to be second or third or fourth maybe. To be fair to her, she's quickened and quickened. It's pure ability that has got me there in the end. She's a great mare. "It's a great story for the Tattersalls sale - to buy a horse and come back to win at The Festival a few months later; it's remarkable. "I'll say it again, Gordon is a remarkable trainer - that is his fifth winner of The Festival and it is only two days old. It's incredible. Whatever happens from now on, it is made. For me to get two and Gordon on five - it's fantastic. I am in a good position - I'm riding for the top trainers and at the top Festivals. I am blessed." Trainer Margaret Mullins was pleased with the run of 10/1 shot Debuchet who finished a one and a quarter-length second. Looking the likely winner up the straight under Danny Mullins, the imposing grey was collared late on by the fast-finishing 7/1 chance Fayonagh who showed a potent turn of foot to claim the two mile Grade One. Nicky Henderson's Claimantakinforgan (22/1) was a length and a half back in third, with a neck to Willie Mullins' Next Destination (10/1) in fourth. 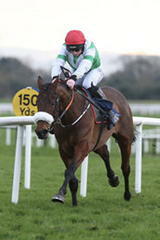 Irish handler Mullins said: "It's a long way home up that hill but I am delighted with him, he has run a great race. He will be a lovely horse next year - it's fabulous." Asked about whether the four-year-old son of Smadoun would head to the Punchestown Festival, Mullins said: "We'll see what he's like when we get home but we're delighted with that."